The cover of Thrawn: Alliances by Timothy Zahn. We at io9 pray to the altar of Grand Admiral Thrawn. This is a well-known fact. 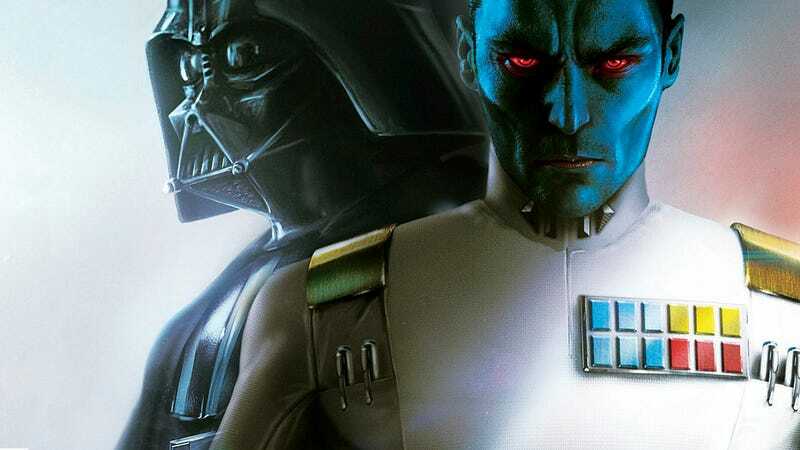 So when the first excerpt from Timothy Zahn’s new book, Thrawn: Alliances came online, there was quite a bit of excitement followed by pure elation at its awesome revelations. The excerpt, posted by StarWars.com, sets up the crux of the book in a tense, fun, way like only Timothy Zahn could do. Basically, Emperor Palpatine needs to send Darth Vader and Thrawn to work together on something because he senses a disturbance in the Force. But where? Well, that’s the best part. If you don’t want to ruin the fun surprise, click here and read the full excerpt. But, below, is just a tiny taste to set up the rest of what we’re geeking out about. Batuu, if the headline didn’t give it away, is the planet that’s currently being constructed at Disneyland in Anaheim, CA and Walt Disney World in Orlando, FL. It’s a brand new Star Wars planet created specifically for the theme parks as a kind of galactic hideaway. So it’s incredibly intriguing to read we’ll be getting stories about it in this book first. Plus, how did Thrawn and Vader know about it? What plan did they interfere with? Was Vader “Vader” already? And isn’t Batuu supposed to be a peaceful place? We’ll find out more when Thrawn: Alliances hits shelves on July 24. Read the full excerpt at the link below.